Welcome to RPC Jr. Sailing. Our summer schedule is now posted. We are looking forward to our 2018 season, running for 6 weeks from the week of June 25 through August 3. Registration will open following the sending out of the May Rocky Pointer and everyone will be emailed in advance of its closing. Registration for sponsored, non-member sailors will take place after member registration closes. As part of registration, parents are required to execute participation, liability and medical release agreements on behalf of all Jr. Sailors. These agreements are located on the RPC site under the members-only “forms” tab. Parents must also register sailors and execute waivers with JSALIS . A fee of $65/sailor will be assessed to your RPC account. A program designed to introduce younger children to sailing. These will take place in our Ideal 18’s, supervised by an instructor. A program for younger children (recommended 8 & above) who want to learn to sail. Children will start off in Ideals and once ready will be paired up (two per boat) and taught the fundamentals of sailing in a safe and fun environment. This program is ideal for anyone who wants to develop from taste into the optimist. Working towards US Sailing level one. This course teaches the student how to sail a course upwind and downwind and to handle the boat with confidence. Working towards US Sailing level two. This course builds on level one and introduces more advanced skills and boat handling with an introduction to racing. This course focusses on timing the boat and sails for optimal performance and safety. Participants will be actively encouraged to attend local regattas and to engage in a racing series. Designed for sailors wanting to tackle new skills in a dinghy with fore and main sails. This course will team the basics of boat handling and sailing up and downwind. 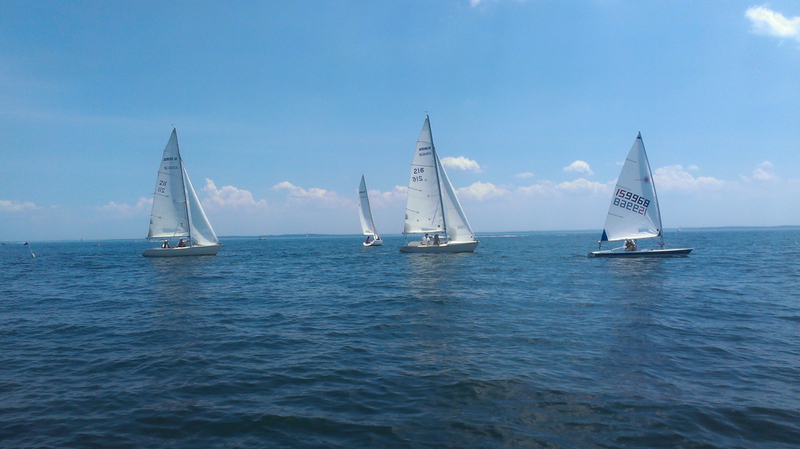 The curriculum is based on the same US Sailing level one curriculum. Rocky welcomes a limited number of non-member sailors who pay a higher charge based on the club subsidy to the program. If you are interested in sponsoring a non-member sailor please share these materials with people who have children eligible to participate and help them with online registration after June 1, 2018. Fees are subject to the non-subsidized rate. They can pay the club directly via check prior to the start of the sailing program; otherwise we will charge your account. RPC owns a limited number of Optimists that are available for rent at $500 per boat for the season. The rental fee for a Club 420 is $500 per sailor, and there are only three available. The rental fee for a Club Feva is $1500, and there are only TWO available. RPC Members have first priority. We will hold a lottery to assign boats to members by May 15. Subscribe to the Rocky Sailing Calendar on your PC, Mac, iPhone or Android device add jrsailing@rockypointclub.com to your Google or iCal application.